The role of sediment organic matter quality and quantity for chlorpyrifos bioavailability was studied in experiments with Chironomus riparius larvae and with four types of organic matter; (1) commercially available extracellular polymeric substances (EPS), (2) EPS produced by sediment microbes, (3) commercially available humic substances and, (4) humic substances extracted from a boreal lake. The effects of each type of organic matter were assessed at three concentrations. We used a 14C-tracer approach to quantify uptake of chlorpyrifos in the larvae, and the partitioning of the insecticide within the microcosm. Carbon-normalised larval uptake was reduced both by EPS and humic substances. However, the reduction in uptake was much greater for EPS than for humic substances: uptake was reduced by 94 and 88% for commercial and complex EPS, and by 59 and 57% for commercial and complex humic substances, respectively. 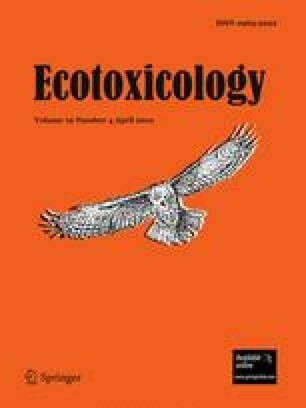 We also found differences in chlorpyrifos uptake, and sediment concentrations between treatments with commercially available and complex polymers, suggesting that minor differences in the quality of relatively simple organic molecules can affect contaminant behaviour in ecotoxicological studies. Passive uptake in dead controls was 40% of that in living larvae. Therefore, both passive and digestive uptake were important processes for chlorpyrifos uptake by larvae. Our results show that both EPS and humic substances affect chlorpyrifos bioavailability to sediment biota negatively and contribute to the understanding of the processes that regulate organic contaminant bioavailability in aquatic environments. We acknowledge Jan Johansson at the Department of Ecology and Evolution, Limnology, for guidance in C analysis of the organic additions, and Mikael Östlund at the Department of Aquatic Sciences and Assessment for field assistance. We also thank two anonymous reviewers for valuable comments on an earlier draft of this manuscript. The Swedish Council for Environment, Agricultural Sciences and Spatial Planning (FORMAS, Nr 21.0/2003-0444 to WG) provided financial support for this study.